This quick and easy lasagne will satisfy family or friends. 1. Preheat the oven to 180 ºC (160 ºC for fan assisted ovens), gas mark 4. 2. Heat the oil in a large non-stick frying pan and cook the onion for 5 minutes, add in the chilli flakes and beef mince. Continue to cook for 5 to 10 minutes. Season with salt and pepper and stir in the coriander. 3. Place 5 of the lasagne sheets into the bottom of a rectangular baking dish (about 2.25 litres). Spoon half of the beef mixture on top followed by half of the ricotta cheese and half of the salsa. Repeat with the remaining lasagne sheets, beef mixture, ricotta and salsa. Sprinkle with the cheese. 4. Cover with foil and cook in the oven for 20 minutes, then remove the foil and continue to cook for another 15 to 20 minutes, until the pasta is cooked through and the top is golden. Let stand for 10 minutes before cutting into sections to serve. 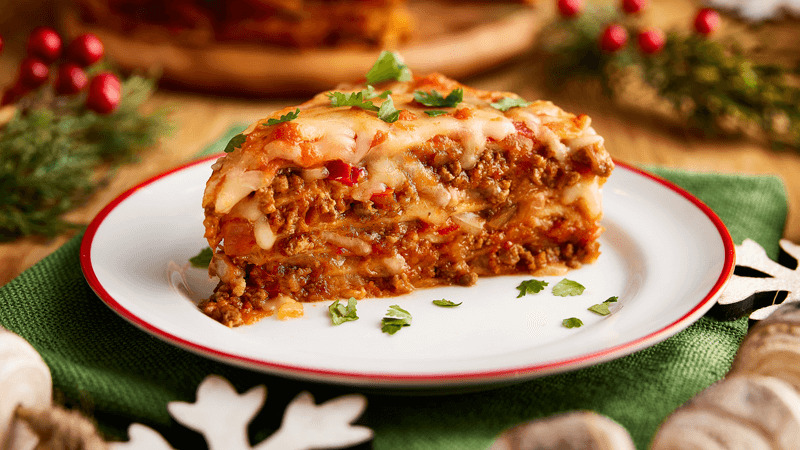 Cover the unbaked lasagne tightly with foil and chill in the fridge for up to 24 hours or freeze for up to two months. Before cooking the frozen lasagne, defrost in the fridge overnight. Chilled lasagne will need about 10 minutes extra baking time. Accompany lasagne with a frosty glass of lemonade garnished with slices of lemons or limes.